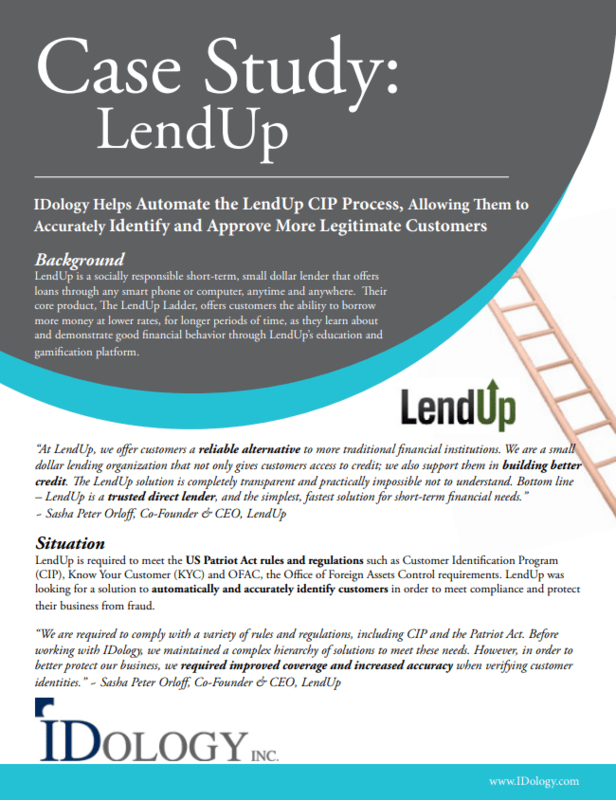 Learn how IDology helps automate the LendUp CIP process, allowing them to accurately identify and approve more legitimate customers. LendUp is a socially responsible short-term, small dollar lender that offers loans through any smart phone or computer, anytime and anywhere. Their core product, The LendUp Ladder, offers customers the ability to borrow more money at lower rates, for longer periods of time, as they learn about and demonstrate good financial behavior through LendUp’s education and gamification platform. LendUp is required to meet the US Patriot Act rules and regulations such as Customer Identification Program (CIP), Know Your Customer (KYC) and OFAC, the Office of Foreign Assets Control requirements. LendUp was looking for a solution to automatically and accurately identify customers in order to meet compliance and protect their business from fraud. LendUp integrated IDology’s ExpectID and ExpectID IQ solutions to identify legitimate customers in real-time, meet compliance requirements and prevent fraud. LendUp also utilizes ExpectID PA to verify the individual complies with the US Patriot Act rules and regulations. IDology was able to quickly and easily implement their solution in just a day which sits at the front of the LendUp waterfall. LendUp has experienced increased approval rates and can therefore confidently approve more legitimate customers while also deterring the bad. 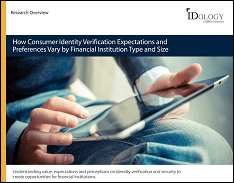 Additionally, LendUp is able to dynamically escalate to Knowledge-Based Authentication only when needed based on risk profile. This reduces customer friction and provides a better overall customer experience. Additionally, IDology helps LendUp successfully meet compliance regulations.